Do you want to provide your little one with a comfortable and safe place to sleep and relax? If so, you want to have the best baby bassinet for your kid. A baby bassinet is mainly designed to act as a sleeping space for young babies. It has lots of benefits especially to the mother in the case of nursing sessions where it provides convenience and manageable. This is where the new mom has limited mobility as she is recovering from delivery.Baby bassinets are crucial if you are interested in co-sleeping. While acquiring a particular baby bassinet, go for the one that offers portability, safety, and convenience. Baby bassinets make it easier for all new moms to cope up with their babies sleep especially while in the newborn stage. You will have the peace of mind as a mother after acquiring a bassinet. On this post, I am going to highlight all the things that are concerned with the best baby bassinets as well as top recommendations. Do you really need a Baby Bassinets? All baby bassinets are not the same. You need to look at some of the bestselling features that distinguish one bassinet from the other. Here are some of the things that you should check before buying a bassinet for your baby. For most baby bassinets, the weight limit is between 15 to 20 pounds. Although some may hold heavier babies than the limit, it is paramount to look out for the right bassinet for your baby's weight. It is also preferable to look for a bassinet that will serve you up to 6 months. Check instructions on weight limit and any other advice that might help you in choosing the right baby bassinet for your baby. The age range for the baby bassinet is 4 to 6 months.A key item to note is that the baby might outgrow their bassinet developmentally hence the baby can be transferred to a baby crib or baby bed. This factor is basically a necessity for the new moms in order to keep their babies safe and enable ease of movement. Portability is a must because moms need to keep their babies near them and also enable movement of the baby from one room to another or to another area. Look for a baby bassinet that can be assembled and disassembled easily. This is because you may require transporting your newborn baby to a family member or babysitter on a regular basis. Also to improve movement have a bassinet with a sturdy set of wheels. When looking for the right bassinet for your baby, check if it adheres to all the safety standards. If the standards are met potential risks involved are substantially lower. To check whether the bassinet acquired has adhered to the required standards check for the labels JPMA or ATSM. The requirements are in terms of mattresses and other parts of your bassinet in relation to a reduction on suffocation or entrapment. To keep your baby comfortable, you need to pick the best mattress for a baby bassinet. The mattress should have the best support to keep your baby comfortable. The support system should be strong enough to prevent bending or flexing while holding your baby. If you want to check if the support is good, press along your mattress edges and also in the middle to verify whether any spot dips easily. The mattress support should also hold the baby firmly in different positions. While considering the perfect baby bassinet for your child, also think about the bedding. It is advisable that you choose organic baby bedding. Such bedding is made of 100% cotton. Choose a baby bedding that provides superior comfort and secure fit. It should also be soft and accommodate to your baby as you tuck him away when asleep. Ensure that you check on the baby to ensure he doesn't completely wrap himself in the bedding. If you are looking for the right baby bassinet for your baby here are top 5 best baby bassinet reviews. 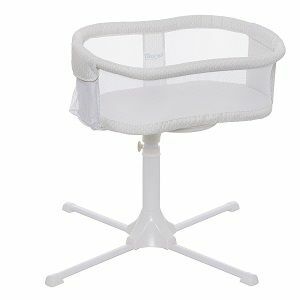 The Delta Children Sweet Beginnings Bassinet is the perfect product if you are looking for quality, safe and affordable bassinet. This bassinet has features that will ensure you have the peace of mind when your newborn baby is asleep. If you are looking for a serene sleeping space for your baby, then I will highly recommend this bassinet. The Delta bassinet has a calming nightlight and soothing music to help your baby to sleep better. The lullabies are pre-loaded and pre-selected. These two features provide a comfortable sleeping area for your baby. This Bassinet has an extra, large two section basket placed under the bassinet. You are able to easily store your baby's essential due to plenty of room that is easily available. You are able to get the convenience of not storing the essentials in another place. The adjustable canopy enables you to style the bassinet according to your preference. You can move it up or down or remove it altogether. Delta has a lightweight frame that has locking casters. The lightweight frame provides convenience in terms of mobility from one room to another. It is comfortable with fitted sheets. Calms fussy babies with soothing music. Extra space for baby essentials. Has a comfortable sleeping area with fitting sheets. Large section to store important baby items. Has a strong steel frame. The music stops after sometime. Too high for night bed feeding. If you are looking the best rated baby bassinet, then this is the right one for you. With its comfortable sleeping area, soothing music and nightlight, you have all the reasons to acquire the bassinet. The Halo Bassinet Swivel Sleeper is ultimately designed for safety and convenience. With its multiple features, this is the best rated baby bassinet. It is highly recommended by pediatricians. 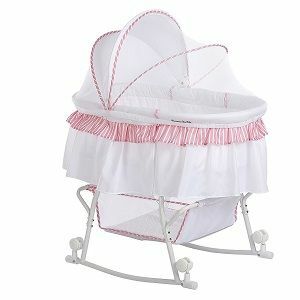 My friend Margaret also have praised this bassinet on her blog Momandbabylab. So, you can rely on this bassinet easily. 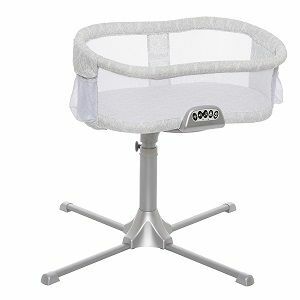 Halo bassinet swivels 360 degrees hence making your baby's care much easier. You are now able to get in and out of bed much easier especially if you had a C-section or your mobility is not that much. The auto-return features ensure the safety of your baby while asleep and you can lock in an upright position if you want. With an adjustable stable base, it will fit most beds that measure 22 to 34 inches. This makes it easier to soothe and make your baby be visible at your eye level. The side walls of the Halo bassinet can be lowered in order to make it easier to tender to your baby while the mesh walls enable maximum breathability. You are able to easily customize your bassinet with the Halo's unique accessories. Each is sold separately. It is easier for new mom and safe for the baby. Easier to see and soothe your baby. You can have Halo's customized accessories. Swivels up to 360 degrees. Easy to see your baby. It rotates making it easy to get out of the bed. Some babies outgrow the bassinet. It is heavy and difficult to move. Not perfect for older or heavier babies. If you looking for a bassinet that enables you to sleep as close as you can to your baby without bed- sharing, then look no more than Halo's Bassinet Swivel Sleeper Bassinet. The Summer Infant Soothe and Sleep Bassinet provide a safe and cozy place for your baby to sleep in. It is designed for babies with a weight limit of 15 pounds and has wheels for easier movement. This is the best portable baby bassinet that comes with modern designs and has other important features. Summer Infant has an adjustable canopy after assembling to block any light that could hamper your baby's sleep. It also has a padded mattress with fitted sheets for better comfortability while sleeping. To help you baby sleep better Summer Infant has 4 musical melodies, 1 womb sounds, 2 nature sounds and soothing vibrations. All these melodies calm and relax your fussy baby or help him to sleep. Summer infant features wheels to enable movement from one room to another. It has a lock for safety when in use. The extra-large storage basket has been designed to store all the baby's essentials. It is also easily attached securely to the frame at the 4 points. Large space for baby's essentials. Designed with locking castors to provide safety. 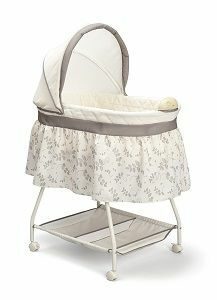 The bassinet features an adjustable canopy. When looking for portability, comfort, and safety. The Summer Infant Soothe and Sleep Bassinet have it all. 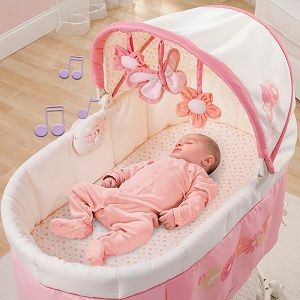 Your baby will sleep soundly with soothing melodies and adjustable canopy. The Halo Swivel Sleeper Premier series has a lot of features that one can look out for a while acquiring a bassinet. It is more comfortable to use, secure and provides the necessary comfort to your baby as well as convenience to you. Halo Bassinet features 3 nature and womb sounds, 3 lullabies and a nursing timer that has an auto shut off. It also includes nightlight for peaceful night sleep by your baby giving you peace of mind. The base will easily tuck in under the bed by requiring only 32 inches clearance. This makes it ideal for small spaces. Halo Premiere Series has an additional waterproof mattress pad and customized 100% cotton fitted sheets. Your child will sleep comfortably having these two items. It is much easier and ideal to use this bassinet because of the 360 degrees swivel especially for mothers who have limited mobility or they had a C-section while delivering the newborn. Comes with additional mattress and fitted sheets. It has soothing melodies and calming nightlight. Has a stable base to adjust to almost any bed. The bassinet rotates so it is easy to get in and out of the bed. It leans or tilts slightly. Doesn’t suitable for tall babies. If you are looking for the best mattress for baby bassinet the Halo Premiere Series offers just that. From now your baby is able to sleep comfortably, be secure and closer to your watch with this bassinet. 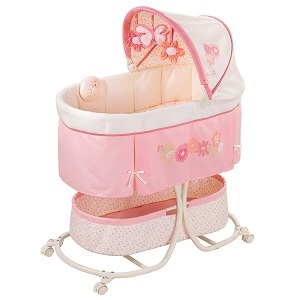 Dream on Me Lacy Bassinet features both a bassinet and a cradle in one place. What more would you want if you wanted the two? It has even more designs that will suit your needs and still offer comfortability and safety to your baby. Dream on features 4 tastefully designed colors. You can easily coordinate with any decor or theme present in the babies' nursery. The basket is large enough to hold all your baby's essentials. It makes it easier for you since all that you need is available in the bassinet. It can easily be transformed from a bassinet into a rocking cradle. All you need to do is to rotate the wheels in an upward position. This transformation works well for those looking for a cradle and a bassinet in one place. Dream on features full canopy for blocking overhead light and as well as act as a mosquito net. You have two things at the same time due to the multi-purpose canopy. Transforms from wheeled bassinet into a rocking cradle. It has 4 tastefully designed colors. A multi-purpose canopy that acts as a mosquito net. It comes with a mattress pad. Has a basket to store important baby items. It can only hold up to 10lb. If you are looking for a multi-purpose bassinet that can be transformed from a bassinet to a rocking cradle and designed colors, Dream on Lacy 2-in-1 is the right choice for you. Yes. A bassinet is necessary since it eliminates and reduces the risk of bed-sharing, offers comfort to the baby, secure and some have soothing lullabies to calm and help your baby to sleep. Also, bassinets come in various designs, colors and even some have additional accessories. Another benefit is the baskets that are under a bassinet which enable storage of babies' essentials. When considering the factors and the best baby bassinet, you have to take account of what I have highlighted. I have given you the top best baby bassinets to choose from with their features, advantages, and disadvantages. I highly recommend you go through this article when acquiring the best bassinet for baby and you will thank me later.